The hands go through a lot in a day, and they are so neglected! We think we’re being “good”, using a gentle cleanser, toner, targeted serum, moisturizer with sunscreen on our face, but what about our hands?? Like any other part of the body, the skin on the hands needs to be attended to. With time, the skin on the hands loses elasticity, the skin develops brown spots from sun exposure, and the veins and tendons become more prominent with surrounding volume loss. Hands age, and they need TLC too. A number of articles have pointed out that hand makeovers are becoming more and more popular as the ring selfie gains popularity. The “NYC Hand Lift” will get you dramatic results with minimal time and effort on your part. BBL by Sciton treats sun-damaged and aging skin to effectively remove pigmentation and the dreaded, and rudely-named, “age spots”. The light energy delivered by the BBL will gently be absorbed by the unwanted pigment (melanin) responsible for these spots in the upper layers of the skin. Over the next few days to weeks, the spots will darken and fall off. Brown spots can be removed with this same technology from the face, chest, and hands. The skin may be slightly pinkish following the treatment. This lasts between 30 minutes and 24 hours. There is really essentially no downtime, and the treatment is quite effective. Most people require 2-4 treatments, with yearly maintenance treatments. As you the face, you can restore volume to your hands as well. 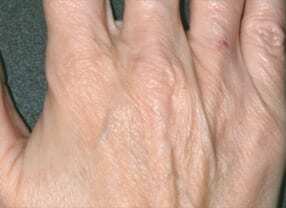 Volume loss in the hands leads to prominent blood vessels and tendons that, frankly, make our hands look “old”. You can turn back the “hands” of time (pun intended) with Radiesse injections. The results are immediate, and last 1-2 years. Exact treatment regimen is individualized to you. A total NYC hand lift runs between $2,000 and $4,000 depending on the current condition of your hands, but it totally worth it to keep your age a secret! Contact us today to schedule your appointment! We won’t tell a soul. . . This entry was posted on Thursday, June 5th, 2014 at 4:12 PM	and is filed under New and Noteworthy. You can follow any responses to this entry through the RSS 2.0 feed. Both comments and pings are currently closed. « Juvederm Voluma XC: face or fanny? For more information on the many procedures we offer, or to schedule your consultation, contact our office by calling (212) 750-1020, or fill out the form below to contact Dr. Liotta directly. Copyright 2019 FacialPlasticsNYC.com - Dara Liotta, MD.